Since I need to make a few mother’s day cards, I thought I should take advantage of such a versatile sketch and fill one of those slots. I know the position of the leaves is a bit odd on the top flower, but I like the symmetry of having the top & bottom leaves in the corners. I didn’t want to go black or brown for the sentiment – felt it was too stark. I found a dark purple that went well with the images and I’m really happy with that result. 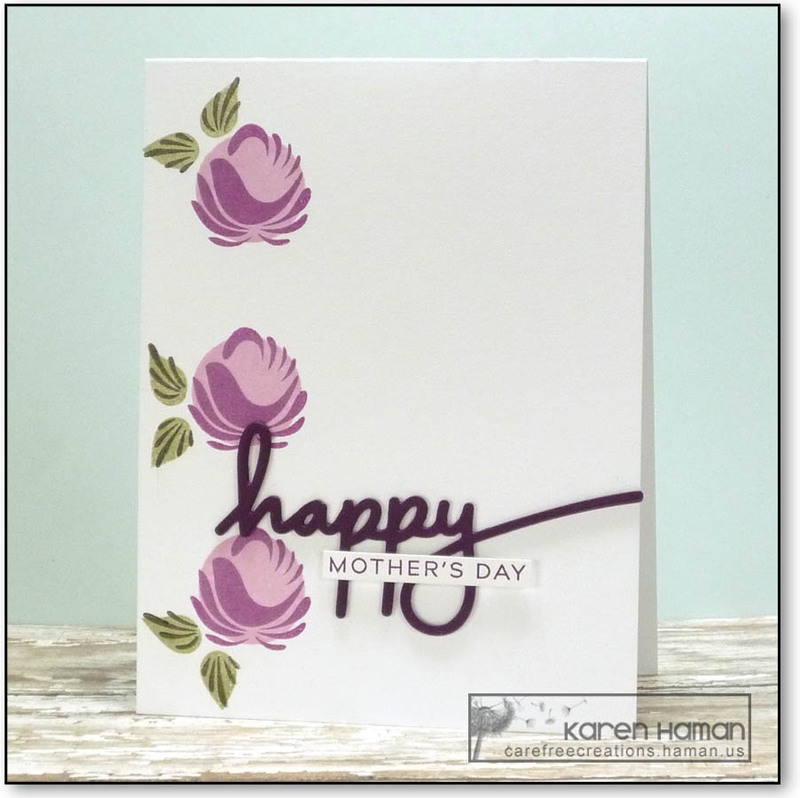 I positioned the sentiment die so it overlapped a couple flowers and the swoosh of the “y” goes to the edge of the card. What a yummy card, Karen – and the lavender makes it look so elegant. Love those flowers and your take on the sketch! One layer CAS perfection! This is so elegant, Karen! Love the colours you’ve used for the flowers. This is really pretty. Great CAS card. CAS sweetness! The dark purple sentiment was the perfect choice to coordinate with the blossoms! Love this card! Those flowers are so graphic and bold. Great with the colors you used.